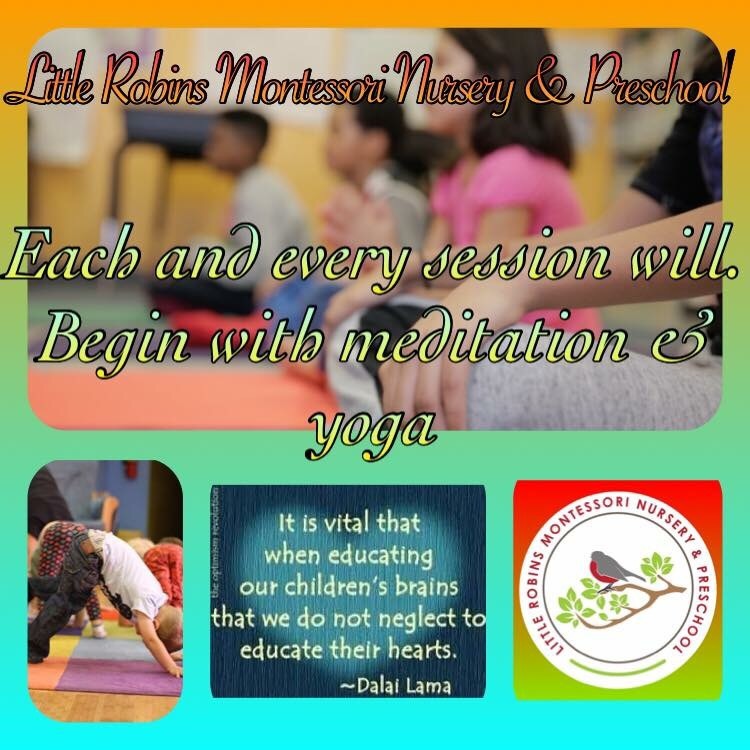 Each and every session will start with yoga & meditation here at Little Robins Montessori Nursery & Preschool. In an age where children are pressured into growing up so quickly, combined with the ever-increasing era of technology, movement is on the decline for many children, resulting in devastating effects like obesity, lack of confidence and stress. Yoga, meditation and mindfulness is a great practice and ethos for children to combat many of life’s challenges like stress by focusing on breathing and meditation, a natural stress-reliever. Yoga and meditation has been proven to reduce everyday stress and anxiety, as well as promote a general good mood and outlook on life. What is Yoga, meditation & mindfulness? Yoga has been practiced for thousands of years. The actual term “yoga” originates from an ancient Indian language called Sanskrit. The activity’s purpose is to unite the body, mind ,and spirit. The physical part of yoga is conducted through a series of asanas, or yoga postures or poses. Asanas are practiced to promote strength training and flexibility through stretching. Meditation and mindfulness practice is a beautiful way to stay grounded. It teaches us to train our minds to be in the present moment so that we can savour the good times while better managing the trying ones. It helps us to stay connected with our true essence, building our sense of self-love and worth. What are the benefits of yoga and meditation for Children? There are important and numerous benefits of yoga and meditation for children. Unlike most other physical activities for a child, yoga doesn’t only promote good health through physical exercise, but also focuses on improving and helping to grow children’s minds, spirits, emotions, and thoughts. Studies have also linked yoga and meditation to better concentration, increased focus, and boosts of memory. Getting into the daily practice of entering into quiet time and breathing exercises, and postures are enormously beneficial and you’d be surprised how willing children are to participate if you make it fun. As an adult, to be able to accomplish all of the above is a pretty remarkable feat. Imagine learning these tools as a young child and then being able to use them your entire life! What if an entire generation of children were blessed with this gift? The world will be a much more peaceful and beautiful place! Here at Little Robins Montessori Nursery & Preschool we are going to make that start in creating a better future! 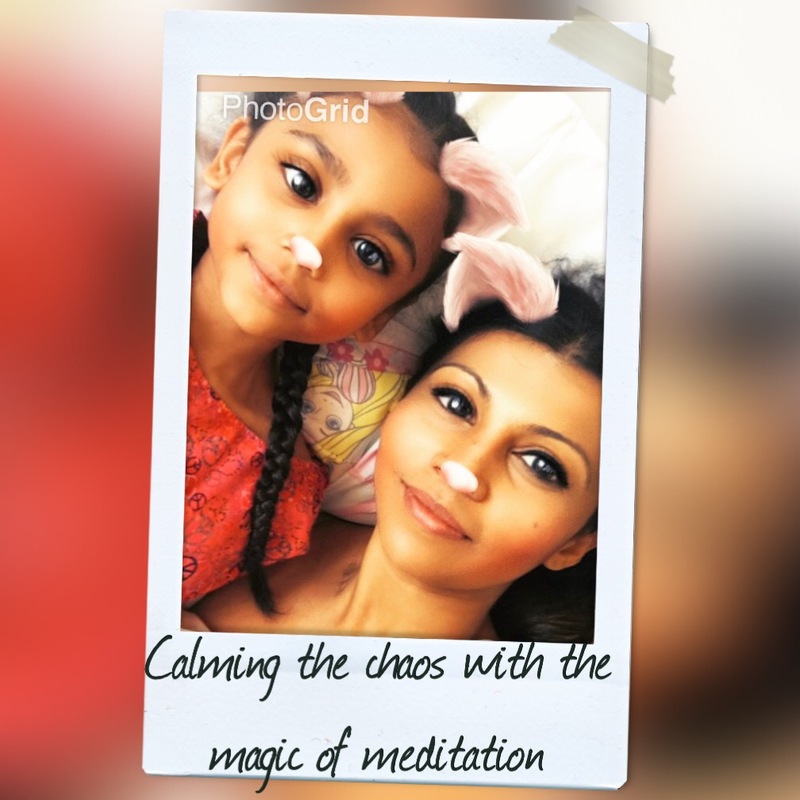 Feel free to read my previous blog on my own personal experience of meditation and how it worked for my 8 year old daughter. A little robin sitting on a tree is never afraid of the branch breaking, because its trust is not on the branch but on its wings. 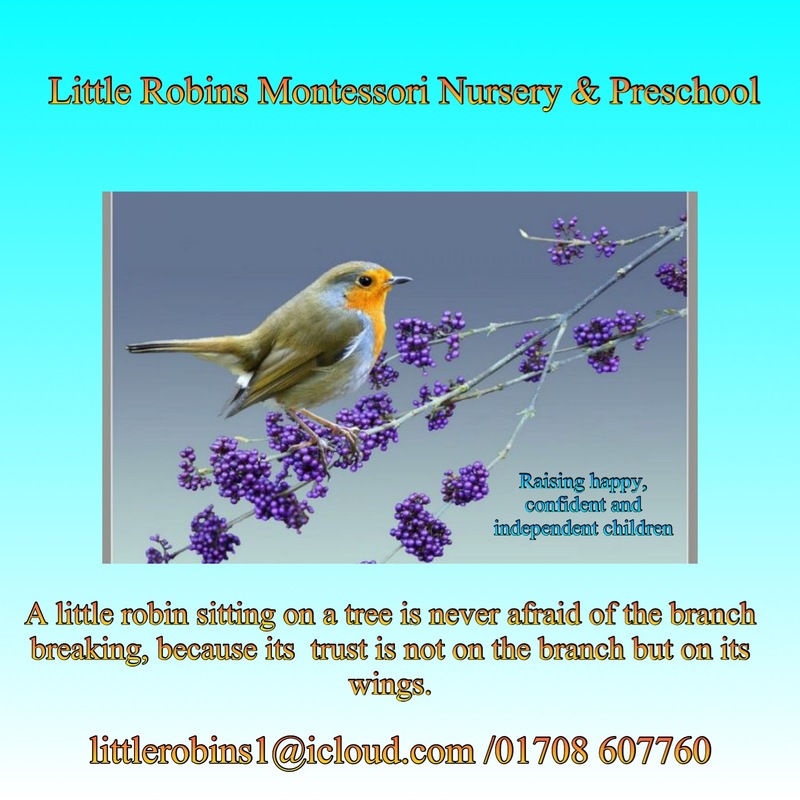 Here at Little Robins Montessori Nursery & Preschool, our ethos is simple; a POSITIVE and SAFE environment founded by mindfulness, combined with a rich variety of curriculum to offer from Jolly Phonics, performing arts, a language, yoga and meditation. This will set the most perfect home for our children to evolve into happy, confident and independant little people! The importance of building confidence in children cannot be over-estimated. Confidence and self-esteem are the foundations on which a healthy life can be built. We believe self-confidence rises out of a sense of competence. In other words, children develop confidence not only because parents and carers tell them they’re great, but because of their achievements, big and small. Sure, it’s good to hear encouraging words from parents or carers but words of praise mean more when they refer to a child’s specific efforts or new abilities. 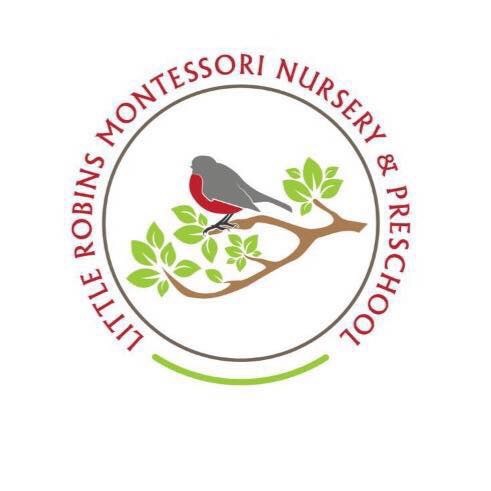 Little Robins Montessori Nursery & Preschool will offer many platforms and opportunities for our children to experience that sense of self gratitude in their own achievements. Also planting the seed inside them to want to feel that pride of accomplishment and that I-CAN-DO attitude in all walks of life, right from day dot! A NEW nursery is to open in Hornchurch this August, creating 18 new jobs and 48 places for babies, toddlers and pre-schoolers in the area.Little Robins Montessori Nursery and Preschool will be offering parents and their children something a little different from other childcare settings, as daily yoga and meditation will form part of the Craigdale Road nursery’s teachings. The nursery is owned by Kavitha Niranjan, mother of two and founder of Tutorial Limited and Tutorial Ltd Performing Arts & Music school, an established Hornchurch company which provides academic and performing arts tuition for children from age three to 18. Offering places for 6 babies, 12 toddlers and 30 pre-schoolers, Little Robins will have a clear focus on preparing children for life, with many fun activities mirroring the home environment and teaching practical skills. Yoga, baby massage, musical movement, French/Spanish, numeracy, phonics and performing arts sessions will also be added to the youngsters’ nursery days to add variety and enjoyment to their learning. Little Robins will launch on August 14 and will be open 7:30am to 6:30pm Monday to Friday, 52 weeks of the year. Full and half day sessions will be available for children aged 12 weeks to five years and all food will be cooked and prepared on site. Montessori education, the method the nursery will follow as part of its curriculum, centres on the child’s ability to self-motivate and self-discipline. The method focuses on the whole child – their cognitive, social, emotional and physical development – and gives them the freedom to learn at their own pace. The theory is that the child will then become a confident, self-motivated learner. There will be emphasis on developing compassion, tolerance, empathy and co-operation, in line with Montessori teachings. Little Robins’ baby room, aimed at three months to eighteen months, includes plenty of toys and books, with a cosy area sectioned off for relaxing and listening to music. As the children grow, sand and water play, painting, chalk and messy play is on offer. The tots room, for 18 months to two and a half year olds, has free flow into the garden to allow the youngsters freedom. Staff help to build routine as well as teaching children to dress and feed themselves, hold crayons and brushes correctly and sit for a short length of time at circle times. In the preschool room, children are given plenty of opportunity to explore and use their imagination. A creative station, role play area, small world, construction, reading area, practical life and free flow into the garden are all available to those aged two and a half years old to five years old. Support is given to those moving on to primary school by encouraging children to think independently, problem solve and follow routines. 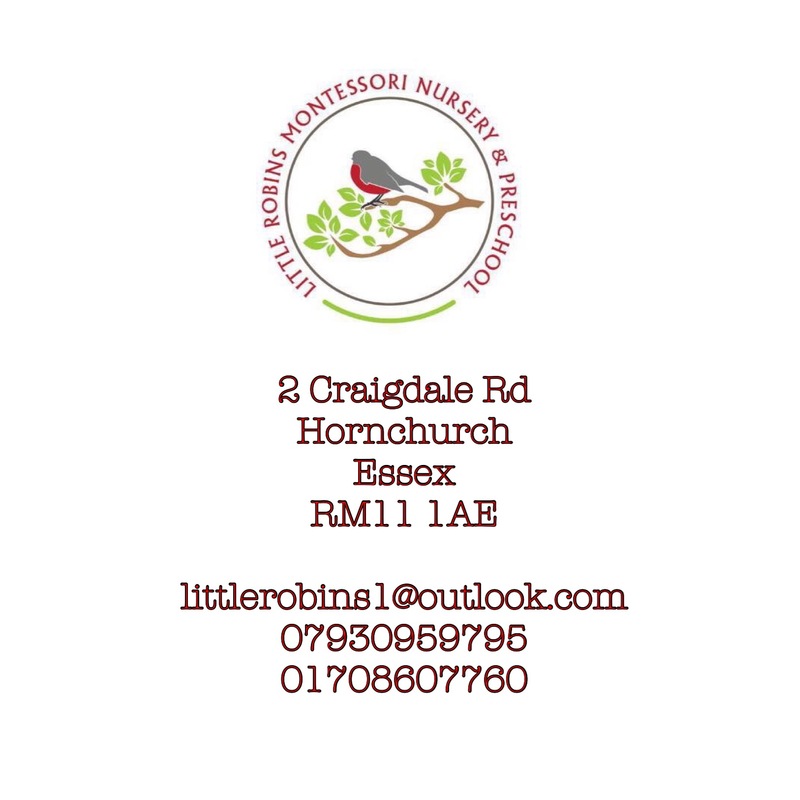 Nursery manager, Sue Young, has 27 years of experience in the childcare sector and will lead a team of professionals to establish Little Robins as an outstanding nursery and preschool. She said: “We are really excited about opening our beautiful nursery in August. At the moment, we are working hard to provide a homely, welcoming environment that will help our children to have fun, feel safe and want to learn through play. As a mother watching your child be put under anaesthetic for any surgery or treatment is a heartbreaking ordeal! 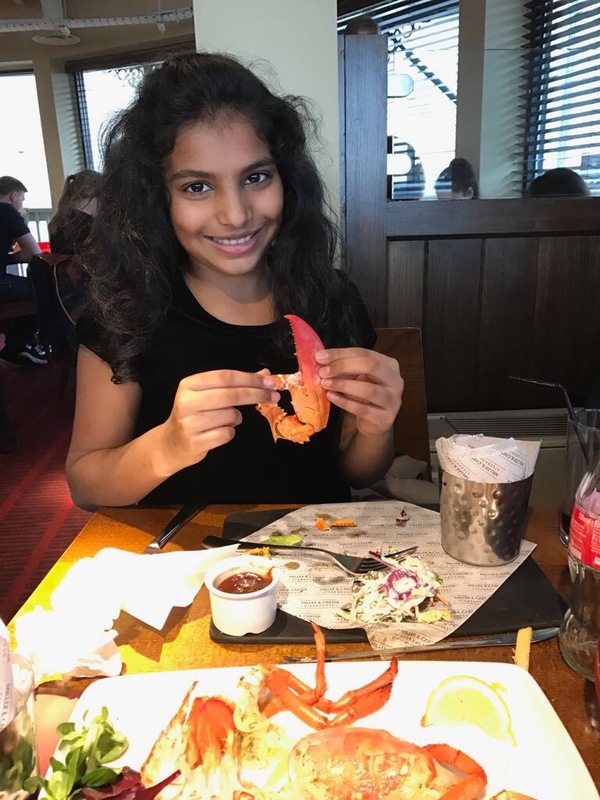 and with my 8 year old daughter Kayal’s permission we would like to share our experience with you all! I for one am so petrified of needles! I’ve never been in with either of my girls for any of their vaccinations. But I knew in my hearts heart that I was going to be with Kayal regardless! I had to put everything I preached into practice that morning- put on a brave smiley face, stay calm, and stay positive! Considering shes petrified of needles like her mummy, she initially did see the needle by accident and had a panic. But she soon calmed herself down through the visualisation and meditation techniques she has been practicing with me. She began to visualise herself on a beautiful beach, she concentrated on each and every part of her body beginning with her toes and working her way up laying on the golden sand. She visualised herself listening to the crashing of the waves. She was so calm and almost as if she had fallen asleep. The medics in the room were so amazed at how she self calmed and soothed herself instantly after seeing the needle. They thought she was in a trance and were hesitant to disturb her, at which point she heard them, and said with her eyes shut tight “don’t worry I’m awake just on a beach in Dubai- just do what you have to do!” She didn’t even flinch when they put the cannula through her vein. She remained calm and still. I spoke to her all throughout guiding her visualisation. But we had made a bet before hand about how many seconds it was going to take for her to fall asleep after the anaesthetic was administered, so I kept her informed- like I promised. We both counted together, she had a smile on her face and we reached 6 seconds and she was out! My little girl was amazing! What could have been a really traumatic time for both of us. Turned out to be a tranquil time on a beach in Dubai! As a parent, words can not describe how proud I am of my strong beautiful little warrior! Our job is to love and protect our children and guide them towards being an independent adult. Life will be stressful but equipping our children with the tools such as meditation and a positive mindset to deal with the most stressful times ahead is just as important as us shielding them against the stresses of everyday life! Panic, worry and even guilt is just some of the emotions mums and dads are feeling at the moment with the 11-plus exams fast approaching. Many parents are going to extreme levels to equip their children with every ounce of information they can get their hands on. Grammar schools are state secondary schools that select their pupils by means of an examination taken by children at the age of 10/11. Commonly known as the 11-plus. There are only about 163 grammar schools in England, out of some 3,000 state secondaries. Thus, making the competition to gain a seat incredibly high, leaving many parents in a form of frenzy this term. That said, this journey doesn’t have to be an exasperating one. So, how can we make the 11-plus journey as relaxed and stress free as possible? It really is possible for both you and your child to enjoy this journey, so long as you start the process early, slowly and gently. Many would argue that you don’t need to start the preparation until the beginning of year 5. However getting your child into good practice, routine and habits as early as year 3 will make this journey so much smoother. There is so much information and resources out there to help you prepare your child. The 11-plus should not be a crash course with last minute cramming just before the exam. Rather it should be a curriculum to follow. Starting early means that your child doesn’t need to sacrifice their little joys of attending clubs and activities or going on holiday the summer before the 11-plus. The exam can be a valuable experience for the child if approached in the right methodical way. Setting daily and reasonable amounts of study establishes good work ethics and is a priceless life time gift to nurture from a very young age. Easier said than done, I hear many of you scream! However, a positive mindset, combined with a stress free environment is the road to success for every child. When a child is constantly witnessing a parent worrying about the exam, and when every conversation in the house revolves around the 11-plus, its only natural for the child to panic but also start self doubting. It is essential that you do not convey your anxieties to your child. If you or your child is feeling frustrated or under stress during revision, take a break: go for a walk, play some sport or take an hour to watch some television. It is common knowledge that children pick up on vibes, so don’t try to pretend to be happy either- once again easier said than done! But kids will sense the truth from a mile away. You need to ask yourself whats the worst that can happen ? If failing the exam is the answer then remember FAIL (First Attempt In Learning). Is that really the worst that can happen? Parents we need to have a reality check here. Many students have had a successful future and have entered into the top Russell Group universities from attending a state comprehensive school. There are also students who have not been academically successful after attending a grammar school. Preparation for the 11-plus can be an anxious time for all concerned. Your child should not be made to feel like a failure. Or made to feel like their letting their parents down if they do not succeed. Make it clear to your child that the end result does not change the unconditional love you have for them. Try to protect them from the stresses and strains of the real world as much as you can. Before I hear an uproar about starting the preparation for the 11 – plus for children in year 3, it doesn’t mean you give a 7 year old an 11 – plus paper to do. But rather start steering them towards the curriculum and getting them into good habits early on like; daily reading, spellings, learning time tables, mastering the foundations of maths; adding, subtractions, division and multiplications. First and foremost; Read! Read! Read! An excellent way to improve verbal dexterity is to implement a good reading habit. Broaden your child’s literature from reading the newspaper, magazines to a variety of different books fiction and non fiction; then talk about it afterwards, get them to describe what they’ve read and explain how it made them feel. This will enable them to unlock their emotions and effective story-telling brings a satisfying increase in marks. As for Maths, practice times tables daily; ensure you’re child is completely utterly thorough. Go over times tables until they do not even pause at all to think of the answer. This gift will save them so much time in an exam. Understanding the core concepts of addition, subtraction, multiplication division, fractions, percentages and decimals and that they can apply this knowledge under pressure, particularly in problem- solving-type questions. Last but not least; Verbal Reasoning and Non Verbal Reasoning; many think these exams test innate ability and, therefore, cannot be coached for. But I believe it is vital to provide opportunities for practice, however, this can be easily done as there are plenty of books on sale, and past papers are easily accessible. There is no magic to it, but if the child has not seen this type of question before the exam they are likely to be completely thrown on the day. All throughout, help your child to unwind by making sure they take regular breaks; tired children can easily get frustrated and find it harder to concentrate. Although a little bit of stress can be a motivating factor, if it gets out of hand it can stop your child from performing at their best. To get those feelings out of their system, encourage them to talk freely to you, friends or their tutors. Having a healthy balance is crucial; make sure that your child has sufficient play time and time out doing something that they enjoy. A child that is happy, confident and at ease will feel encouraged to work hard regardless of whether you have decided you want your child to sit the 11-plus exam or not. A few words of gentle encouragement, frequent praise and an explanation that exams are not the be all and end all will go a long way to improve your child’s confidence, the 11-plus journey and ultimately their results. All throughout, help your child to unwind by making sure they take regular breaks; tired children can easily get frustrated and find it harder to concentrate. Although a little bit of stress can be a motivating factor, if it gets out of hand it can stop your child from performing at their best. To get those feelings out of their system, encourage them to talk freely to you, friends or their tutors. Having a healthy balance is crucial; make sure that your child has sufficient play time and time out doing something that they enjoy. A child that is happy, confident and at ease will feel encouraged to work hard regardless of whether you have decided you want your child to sit the 11-plus exam or not. A few words of gentle encouragement, frequent praise and an explanation that exams are not the be all and end all will go a long way to improve your child’s confidence, the 11-plus journey and ultimately their results. We all want our children to make the most of their education. However, when you watch a child diligently putting hours into their revision only to be rewarded with less than remarkable grades or whether you are getting increasingly frustrated as you watch your teen/tween fritter away hours on their phone, iPads or sprawled in front of the TV whilst only putting minimal effort into their studies, it’s not easy knowing what to do. As a parent we feel helpless, frustrated and at a loss about how to help. You know you should be taking a leadership role, showing them how to study effectively so that their education opens doors for them for the rest of their lives. But how do you do it? Here’s just a few ideas that I wanted to share with you. Find the right time to talk them. When everyone is calm and happy (not in the heat of the moment when you’re trying to get homework done, cook the evening meal and deal with urgently washing the P.E. kit all after a day at ‘work work’). Talk to your child about what’s working and what isn’t in their homework and revision schedule. However, don’t start with telling them what you think is going wrong (and spiralling into ‘nag’ mode). But try and ask them what they think is going well and what isn’t going so well and move the discussion on to a positive do-able solution from there. A positive mindset, habits and routines are fundamental to success. Good habits are behaviour patterns that support success and they are entrenched through routine. Children that start young and are in this regular routine from a young age are most likely to adapt to this sooner and easier. But it’s never too late to implement a routine. Talk to your child about how they would like to schedule their homework/revision routine. However, the routine isn’t just about their studies and completing their homework. It’s about achieving a balanced life, this is so crucial. Get your child to prioritise their interests and leisure activities and make sure they can fit in the things that they most value. If they’re able to enjoy themselves as a reward for their studies, they’ll be more likely to stick with the routine. Vice versa, you can also use this as a ‘ban’ or ‘time out’ from their choices of reward if homework isn’t completed as form of a disciplinary if and when you really need to. Again, get your child to identify the biggest distractions to their studies. I’d guess that the top three are their iPad, TV, phone, gaming and some equivalent of Netflix. Instead of nagging them about putting their iPad down, get them to identify ways that they can manage these distractions. If they’re at a loss, suggest things like putting the phone/IPad outside the room while they’re studying, or using a set time for enjoyments and specify a daily set time for focused study sessions. Bridging the gap between parents, students and teachers have proven valuable for students. Students respond very well to parents participating in their schooling – whether that’s just being aware of their progress and understanding their achievements, or whether its when parents decide to take a more active role and become involved in the school itself. Either way, greater parental engagement often motivates the child to do well. But in order to establish and maintain this interest, there needs to be regular and reliable communication and sharing of information between the school and parents. Organise a meeting with your child’s teacher or even Headteacher (if needs be). Get to the bottom of how best to tackle problems/weakness areas. The open communication between all parties will play a big psychological difference for your child. This will put parents in a stronger position to help their child’s learning, and will ensure children get the most out of the education system through a united support network. When your child gets feedback on their work, sit with them to read the feedback and read through the work again to identify why the feedback is relevant and talk about how they could have improved their work. Teachers pour hours into marking and there’s a goldmine of information in their comments about how your child can progress. Making a habit of studying and implementing these comments will lead to faster improvement throughout your child’s life. Grab those golden opportunities such as when your child shows a strong interest in something that they’re studying make an effort to encourage that interest. It could be as simple as talking to them about it. You could look it up on the internet with them, take them to the library to get some books on the subject or even plan a day trip that will bring the subject even more to life for them. The key thing here is actively showing your child that you’re interested in what they’re learning and that you care about how much effort they put into their studies. By showing your interest, support and concern for your child’s achievement at school whilst helping them to take responsibility for their own studies you will decrease the stress of school work and exam season. Work together, have a positive attitude and outlook. Couple this with setting up the good habits outlined in this post and engaging your child in conversation that encourages reflection on their performance will, over time, help your child develop into a better, confident and happier student.